CyclingPub.com - Vuelta a España - Miguel Angel Lopez: It is a special season for me! 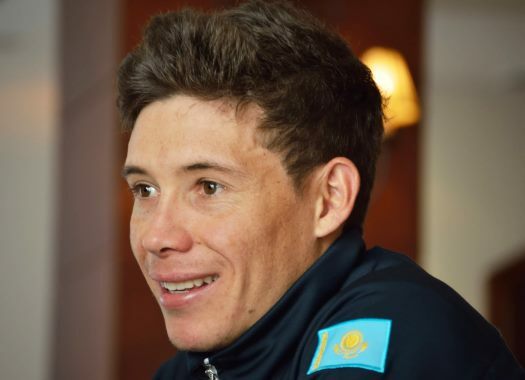 Miguel Angel Lopez (Astana) stood on the third step of the Vuelta a España's podium in Madrid. The rider had already achieved the same result at the past Giro d'Italia. The rider showed a strong performance that put him in the third position of the General Classification in the penultimate stage of the race. "I am more than happy with this result," the Colombian commented. "Coming into the second Grand Tour in a season, I did not know what to expect since I did not experience this before. The Giro d’Italia gave me a lot of confidence in myself as well as in my team, which supported me really well in Italy, bringing me to the podium in Rome. "So, here in La Vuelta, we decided to move on day by day trying to reach as high as possible. For sure, it was a super difficult race and we had to stay concentrated during all the three weeks, but finally, we did it! I want to thank the whole Astana Pro Team for absolutely fantastic support. It is our common success. Lopez also stood on the third step of the Giro d'Italia podium last May. "It is really great to achieve a second Grand Tour podium in the same year, it is a big result for me. I felt strong during the race and, of course, I wanted to win a stage so much. "Three times I was so close for a win, finishing second, but from the other hand I knew, if I aim for the stage results, I could miss the final podium, which was my biggest goal. I am so happy to step on the podium here in Madrid! It is a special season for me!"